Well, despite shoveling as much yummy French cheese, croissants, wine etc down my pie-hole... followed by a weekend of sheer excess (we got through boxes of wine! 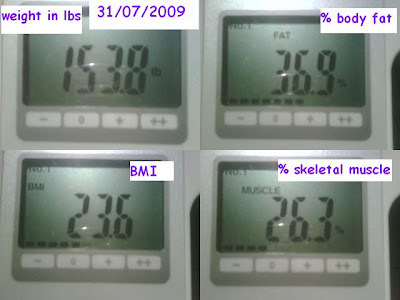 ), I haven't really gained any weight! In fact, when I left for warmer climes, my weight had crept back over 11 stone - bahh. Today I thought I'd bite the bullet and hop on the scary scales and was pleasantly surprised to see myself back under (albeit just ever so slightly ;-) ) 154lbs! a) I've found in the past that holiday weight has a habit of sneaking on the week after the week after a holiday! Kinda like DOMS (Delayed Onset of Muscle Soreness) which is basically that bizarre thing that happens when you feel great the next day after running/weight training, but later on, or the next day you find you hurt like hell! I've done road races where I've felt superb the day after... but then hobbling around like an invalid the next - it's most odd! I have actually started already, hurrah! I also tried out another shoulder move, the Dumbbell Shoulder Front Raise - though not exactly like this clip as I don't feel comfortable raising my arms higher than shoulder height - it causes my back to arch and means I'm swinging with the motion a bit - don't want to risk hurting my back. I did my Lower Body Workout #2 at lunch time and was really chuffed by the fact that I was able to do it! I started off feeling quite tired and worried that I'd only be able to do 2 sets (I do all the exercises as a superset) but was pleasantly surprised at my surplus energy. Also at the fact that I didn't drop the weights! I'm still using 12.5kg dumbbells and have no desire to move up right now tbh. When I first started using them they would literally drop out of my hands by half way through the 2nd set, and during the 3rd. Any exercises that required me to hold them for any time - like forward and rear lunges where I do 10 reps per leg instead of in total - i.e. 20 reps really - my grip would start failing and they'd slide from my grasp. Yesterday I was fine right up until the last set of rear lunges where at about 8/9 they were starting to slide. I'm sure this'll help my climbing too as good grip is vital! I didn't really feel much yesterday until I was legging it up the escalator at Oxford St (went to meet Joe at my company's store - going to buy some rather lush brown leather sofas, can't wait!!) and realised that my bum was quite sore!! Today I am very achy, and I love it, that familiar feeling is back again - huzzah! I've decided that I need to split out my workout further. I'm going to start concentrating on just one area, or a smaller groups of muscles as I just don't have the time to do all my exercises in one or two hits!! I haven't worked out what I want to do just yet so will continue as I have been doing until I work it out properly. I haven't got a pic of Joe finishing the etape as it's on his camera which he left in his crossbar bag and got sticky from race gels - smart! Here's a pic of him, complete with medal, at 3am (that same night!!) with our 'token girl' (i.e. an actual rider - not just one of us WAGs!! ;-) ). This woman is a legend, look at her, there's nothing to her! But she took on the mountain and won, beating *so* many other men in the process. To put it into perspective - out of the 8500 riders who started the race, 7162 finished and out of that, the women numbered a mere 234!! As promised, here's a picture of my 'gym', haha. The first night our room was amazing, all stone with the huuuuge bed raised up in the middle of the room and a walk-in floor-level shower... though I swear the hallway was haunted as the light kept turning itself on and off!! We only had that room for one night though, boo, so ended up in a smaller one which was nevertheless quite adequate for everything but skipping!! I managed to get some training in though, it's amazing how much you can do with very little. Resistance bands are great as they're super lightweight but can provide some real, well, resistance! I would like to point out that my waist is actually smaller than this, no, really, haha. The corset thing is something Joe's Mum picked up for me from a charity shop and is a size 12-14... although that's perfect for my lower half, the thing wasn't intended for that so I had to keep hoisting it up as I couldn't tighten it enough at the back! I discovered yesterday that Sainsburys Market in Victoria have started selling Two Chicks liquid egg whites - hurrah! I knew they sold them in Waitrose and other sainsburys but hadn't found any nearby to me. Very chuffed with my discovery, bought 2 cartons, one's gone in the freezer, the other straight in the fridge. besides, I wouldn't dream of buying anything other than free range eggs for normal everyday use, so why would I drop my standards for the sake of my weight-loss plan. I'm totally with you on the egg situ. I'll only buy free range so although my cats get some egg whites I do waste some. According to two chicks website there isn't a single place in Kent that stocks them! Ah well - all in good time I hope!